Computer and microphone, with free recording and FFT software such as “Audacity”, available off the web. Have a look here to see what the options are and how to do it. A thicknessing gauge that can reach inside the back when it has the sides or bouts on. This is perhaps the tool, along with the small thumb planes that I use most. It cost about £65 ($130) on eBay, new. There are various plans for making your own from wood etc, but I found that I just couldn’t get the accuracy with a very crude homemade (wooden) version to reach into the back when it has bouts on. But if you only do thicknessing on new plates then simple home - made gauges using levers can work well. Note that training your thumb + first finger (calibrated digits) is also very useful! A good set of chisels, and/or gauges flat and curved. A kitchen balance or scales, with better than 1 gram accuracy, shown here with a jap saw. “The harder the metal of the scraper the harder it is to sharpen but the longer it holds the edge. They reckon you need a special burr tool but I use a halfords 3/8 chrome vanadium socket extension bar to round the edge over, it's much harder than the scraper and is easy to hold. I found that the most important part of sharpening is to ensure a smooth square edge on the scraper before rolling the edge over, this really needs the oilstone to get it right. Getting the curl right took me a while but about a 30-40 degree angle from horizontal seems to work well, that and a fair bit of force with a few passes, you really need to be able to feel the burr sticking out. They work better on the maple than the spruce. The thumb planes are a doddle to make, slightly trickier to make blades for, but again the pound shop scrapers came in useful although cutting the blades was hard work with a hacksaw, a dremel would be better. They clog pretty quickly but I'm not precious about them so I've been modifying them as I go along and they work well enough for me (ignorance is bliss). A small flat plane with about 1 1/4” cut: to tidy up the top of the bouts and blocks. You’ll need a good oil stone to keep it sharp too, and a honing guide to get the angle right: you can make a simple one out of hardwood. Glue-pot for animal glue: I use a Boots baby-bottle warmer, about $25 new. It is set at 55 - 68 deg C, a mid-range setting, as I calibrated this one. Do not boil the animal glue, as it is protein-based and is weakened by high temperatures. Add the pearl glue along with water (about 1:2) as it goes into the small pot - the kind used in hotels for marmalade or jam is good for small jobs. When not in use I keep the mini-glue pot in the top of the fridge to stop mould growing on it. Do not use this glue on toast, it tastes disgusting. Note that a violin front needs to be glued on with well diluted glue as it will need to come off again in a few years, and the glue needs to give before the spruce does. A wax heater such as this Babyliss one can also be used, but I have not checked that this one can go up to 68 deg C.
A ‘Dremel’ type hand-held router. This was a “Power Craft” Combitool sold by Aldi in the UK for less than £25 ($40), with a useful flexible drive shaft. 10k to 35k rpm, but only 160 Watts. I use this, or its bigger brother to grind down the over-thick bouts (sides) of factory fiddles using a cylindrical sanding head shown. You can also use this for routing for the purfling with an adapter to keep the distance from the edge and the depth constant , and cutting to a depth of ~1.5 - 2 mm. There is a video on YouTube (click right) showing purfling being cut with a router connected to a Dremel. A drill press. A basic model can be bought new for about £60 ($100), and is indispensable. It may be worth paying more - there are some very useful hints here at Pete Shugg’s Power Tool page about drill-presses. He loves the the Safe-T-Planer cutter too: see later. Mowry Strings uses the Safe-T-Planer cutter (about $50) in such a drill press to carve the external contour profiles of mandolin backs, which are like violin fronts or backs. He calls it a ‘topographic step method’. This is an alternative to using hand gouges for carving. I’ve not tried it yet. The Planer head is apparently also useful for thinning the raw bouts to 1 to 1.2 mm. A small Bandsaw. I bought a 12” (used) Clarke CBS-12WB 3-wheel bandsaw. It cost about £60 ($100) off eBay. It dates from about 1993, hardly used. This is the older single-speed version with a 6 mm blade, and here is a copy of the handbook / Owner’s Manual for it here as I can’t find it anywhere else on the web. There is a later variable speed version, still available from Machine Mart. Scrapers, curved: see note about thumb planes. I also use Stanley knife blades too: they have a straight edge and are very sharp, and with grinding they can be used to make knife blades when glued into a wooden handle. Old carbon steel kitchen knives, if you can find one, are useful sources of good steel for blades and scrapers. A pencil gauge: Derek Roberts is shown using one here. Here’s an experimental pencil gauge I made last year . It’s invaluable for visualising the arching of the front and back plates by using ‘contours’: like a map of the countryside with its hills and valleys. It is used when the back surface of the belly of back plate is still flat: i.e. before gouging out the inside of a plate. The pencil clamped in the top bar marks the top of plate while the top of a bolt beneath keeps it fixed distance from flat side of the plate. I used an M6 bolt which locates into an M 6 nut, which in turn is glued into the bottom bar. A wing nut locks the bolt into position. 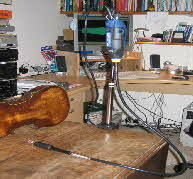 A second M6 bolt (with its wing-nut to lock it) allows the gauge to be opened out and then closed up again keeping its calibration when the violin plate is held down on a ‘carving board’ above the workbench. A piece of plastic acts as a ‘hinge’. Use M6 nuts and bolts for all such projects. They have a pitch of 1.0 mm: one turn of the bolt or nut moves exactly 1.0 mm, so adjustments of say 1/2 mm are one half turn - easy! The gauge works ok but you can see I used the wrong wood: the cheap softwood of the vertical split straight away! Use hardwood or better, metal, say steel or ali’. Clamps (a full set) to hold the front on while it the glue sets, and various sizes of G-clamps too. I made 2 C-shaped clamps shown here to reduce the number of spool clamps needed and make the operation of clamping quicker: it needs to be quick so the glue doesn’t gel while the top or back is glued on. A knife to remove the front. I use a old table knife that I’ve ground down and shortened on a bench grinder. It needs to be quite thin, with edges not too sharp: I’ve cut myself quite badly with this knife a couple of times as a front or fingerboard can suddenly give way and the knife goes out of control. So take great care - always cut away from you left hand. Here are some web pages on opening the violin or viola front (belly) with such a knife - they can be found here and here. using heat, bend a piece of maple that is 1.0 to 1.4 mm thick and 32 mm wide. The rib bending is done with a rib bending iron (about $150-$200 new, or less from China), or you could use a household iron as shown by Jonathan McKinley here. Or you can use a hollow metal tube gently heated inside to about 200 degC with a blow torch or heat gun .... But, do take care you don’t burn your hands, clothing or the house. Touch-up varnish (not water based!) and good brushes. I use transparent oil paint (e.g. Burnt Umber) to colour the clear varnish, or oil paint mixed with Liquin to lay down a thin glaze between varnish layers. Sandpaper, and fine emery cloth from 400 to 1000+ grit. I use water (with a touch of detergent), or baby oil for fine wet-and dry sanding with the emery cloth. A soundpost setting tool, which can be bought or made.